We have the power to choose the way we deal with different anger-provoking situations. The choice is between reacting and responding. But really, how different are these terms? Reaction - It is defined as an act in response to something. You hit me; so I’m going to hit you. You cheated; so I’ll cheat too. You annoyed me, so I’ll get my revenge. You yelled at me, so I will yell back. A reaction is a reverse movement or tendency, or an action in a reverse direction or manner. Reactions are done on impulse, without putting much thought into it or considering what the end result may be. 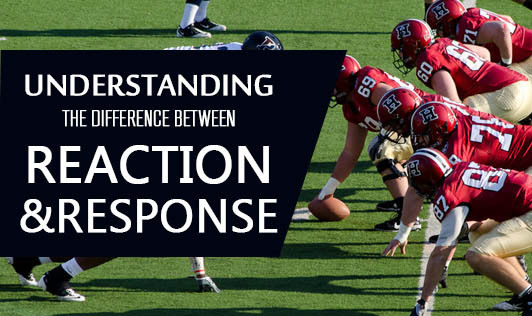 Response - It can be defined as saying something in reply to an action or statement. Response is more thoughtful and done with reasoning. People who respond put their thoughts ahead of their actions. They think and formulate an intelligent and suitable reply before going vocal. Imagine yourself going to a crowded place such as a concert, sporting event, bar, or night club. As you enter, you bump into someone and before you can say sorry, the person pushes you. Why do you think the person did this? Perhaps he/she may have thought that you bumped on purpose and wanted to pick a fight. The push they gave you in return is a reaction. It was like reflex, where they did not pause to reason. It was just spontaneous and thoughtless. Now imagine; what if the other person had stopped for a second before they pushed you? If they did, they may have heard your apology and would have been more cordial. This momentary pause that one takes before acting out is called response. Response is guided by rationality and logic. It is the best way to deal with situations because when one tends to reason, they begin to see the event from their opponent’s point of view. The choice of reacting or responding is entirely in your control. Your actions are the way to express your thoughts and it can turn out best for all if you just pause and think for a minute.